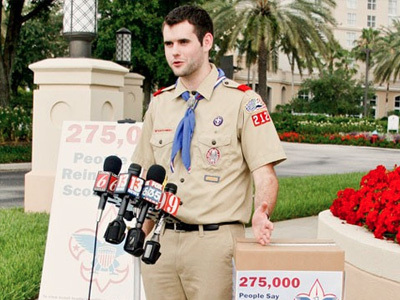 Activist and Eagle Scout Zach Wahls says that what an anonymous group decides can’t stop him and others from making the Boy Scouts more inclusive. This week, the Boy Scouts of America made a huge national stir by affirming its anti-LGBT policy. That is to say, they made a huge national stir by doing nothing new. The only "new" thing about their announcement was the fact that they reached this "decision" by appointing a secret, 11-member subcommittee that "studied" this policy for "two years." This committee, that had a "variety of beliefs" on this policy, somehow managed to reach a unanimous decision. Twice. According to conflicting reports from the BSA, they first presented their conclusion back in February of this year. Then they presented it (again?) on Tuesday. The timing of the BSA announcement, however, could not have been more politically expedient. On Monday, 24 hours earlier, the BSA learned that the vice president of their executive board, AT&T CEO Randall Stephenson, had gone on the record not only opposing their anti-LGBT policy, but also committing to work with fellow board member Jim Turley, Ernst & Young’s CEO, to end it. A few hours later, they learned that Jennifer Tyrrell — the gay den mother ousted from the Boy Scouts who rallied more than 300,000 people to sign her Change.org petition — planned to deliver those signatures to BSA’s Dallas headquarters on Wednesday. Clearly, somebody inside the BSA decided this was unacceptable. Having learned that the resolution to end its policy of discrimination actually stood a chance of working its way through the BSA's executive board, the BSA dropped the hammer, trying to crush this grassroots movement to help the Boy Scouts become more inclusive and accepting. In their eyes, this issue is now resolved and the book is closed. Indeed, they've even stopped answering calls from Fox News. Fact is, the movement to end the BSA’s antigay policy is ramping up, and is poised to be stronger than ever. On Wednesday, I launched a Change.org petition demanding transparency and accountability from BSA and a commitment to allowing the executive board to actually vote on endingthis anti-gay ban at their May 2013 national conference. As of this writing, this petition at change.org/scoutsvote now has more than 25,000 signatures, with thousands more signing every hour. In addition, amid all the furor of Tuesday's announcement, the national media has largely overlooked the fact that yesterday, Minnesota's largest BSA unit, comprised of over 75,000 members, affirmed its policy of full inclusion for LGBT people. The Northern Star Council has just laid out the roadmap for other scouting bodies for moving forward on this policy. Scouts for Equality, a group I founded for current and former members of the BSA opposed to this policy, will continue to organize and mobilize units like the Northern Star Council all across the country to adopt policies of full inclusion. We will work with other disenfranchised Scouts — of whom there are many — using Change.org's online organizing platform to lobby local troops and councils. No secret committee is going to silence the thousands of scouts and scout leaders who want to see an end to this antigay policy. We will continue to mobilize grassroots support from Eagle Scouts and others to transform scouting into an inclusive organization that values fairness and equality. That’s why, as an Eagle Scout, I’ll be attending the 100th anniversary of the Eagle Scouts at the National Order of the Arrow Conference July 30 through August 4 to rally current scouts and scout leaders to support an end to the antigay ban. If the BSA is willing to circumvent its own internal process for progressing and growing as an organization, that's just fine. We'll circumvent them and take this straight to the grassroots. The BSA operates on a franchise model, after all, so there's really nothing they can do. Charter organizations (like schools and churches) give access to the BSA — not the other way around. Secret committees of 11 people do not and will not speak for more than 3 million scouts. Though the old guard at the BSA may be unwilling to change their position, we suspect that the young people actually involved with the organization all across the country will prove more thoughtful. ZACH WAHLS is an Eagle Scout and the author of My Two Moms: Lessons of Love, Strength, and What Makes a Family.